By Rebecca Nickols on December 16, 2010 Visit Rebecca's Website. After the chicks had moved outside into their coop/run, I realized that it was time to purchase a larger feeder and waterer. We looked at automatic or treadle feeders online and came up with this option. It’s rain and rodent proof, holds about 6 pounds of feed and it’s basically an awesome contraption. During the construction, we questioned if the chicks would weigh enough to operate the treadle. An adult Buff Orpington weighs about 5 pounds so we put a 2 1/2 pound can of oil on the ramp and it worked! There was also a little concern about whether the flap would come crashing down on their necks, but I tested that also and it didn’t seem to appear to be that lethal. We purchased one of these for our pheasants. We had a problem with mice and squirrels getting into their feed. But unfortunately this didn’t keep them out either. They would wait until the pheasants opened it and jump in, feast away until the pheasants opened it again. We even have some squirrels large enough to open it themselves!! Very discouraging. Catch them squirrels and make a chicken and squirrel stew! UM-um Good! I got a good chuckle out of this one!! Neat device. If this is out where it could get rain on it, I think it would be better if the roof sloped away from the feed dispensing side, maybe with an eve over the feed. 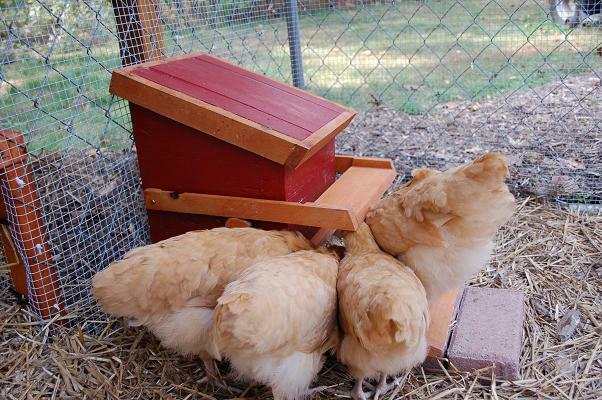 I couldn’t wait to try building your treadle chicken feeder, but I really didn’t want my girls (the ones who are the sneaky ‘side feeders’) to get whacked in the head while learning to use it. I knew that if I “thought on it” long enough, I would come up with a solution. And… I did! When I built the feeder, I simply made the “treadle” part 8″ wider than the body of the feed box. In other words, the treadle sticks out 4′ to either side, so those “side feeders” are also standing on the treadle. Now when the chicken in front steps off, the side-feeders are also standing on the treadle. No more whacked heads! Does anyone else have concerns about the pressure treated wood being used for this feeder? I’m so very glad you posted this! 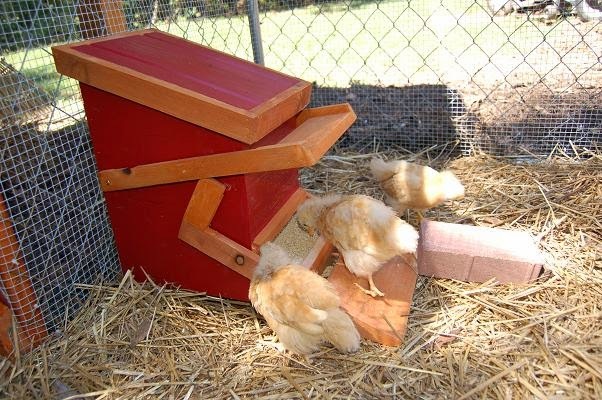 I have been looking at an automatic feeder but it’s $195 and for three hens, a little pricey; this is a great alternative! I have a very serious problem with the doves in the neighborhood eating most of the girls’ food if they don’t eat it right away. I think we are going to give this a shot thanks for posting not only the plans but the video of how it works…anything to reduce rodent population is a super thing!!!! I have a neighbor that has been looking for a good solution to keep the sparrows out of her chicken feeder. I think the treadle feeder is a great idea that could solve her dilemma. Thanks for posting the plans!